For those of you who ever wished you could put your SMS system on a timer, Textalert was developed for you. This app makes your texting service work overtime by allowing you to schedule alerts to be delivered to your inbox at no extra charge to you (as long as you are alerting someone with a domestic number). It costs $0.99 and can be used on iPhone, iPod Touch, or iPad but it requires iOS 4.0 or later. 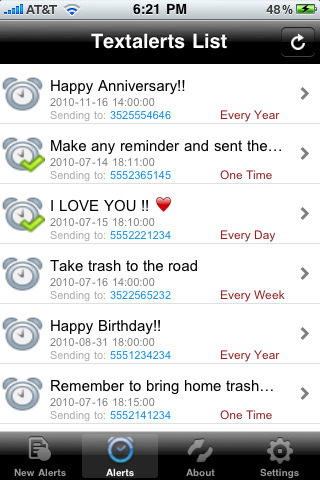 You can use Textalert to set up reminders for yourself or your friends via text message. When you get into the app you have choices at the bottom of the screen including New Alert, Alerts, About, and Settings. You use new alerts to create an alert. You start by adding the phone number you want—you can either type one in or add it from your contacts list—you then type in what you would like to send, when and how often you want it sent, and hit send. You are allowed 160 characters in the message box and you are given a choice of smiley faces and various other expressive icons to assist you in getting the message across accurately. Your alert should then show up in the Alerts list. The quantity of Textalerts you are allowed is unlimited, so feel free to go wild and irritate your friends. The About section includes the contact information for the app for you to give feedback. The next category is settings, where you can create a username, enter in your phone number, your time zone, and turn automatic login on and off. If you are wondering what the point of this app is when you have a dozen or so calendars—electronic and otherwise—the answer is that even with ticklers it is easy to forget things on your to do list. Textalert is helpful in that it reminds you through SMS, which I have found is much more efficient. There is nothing more distracting then receiving a text message. AppSafari review of Textalert Plus was written by Vanessa Paszterko on July 20th, 2010 and categorized under App Store, Chat, Contacts, Productivity, Social, Utilities. Page viewed 5206 times, 1 so far today. Need help on using these apps? Please read the Help Page. We accidently submitted a beta version of the Binary, and not the latest version. The DAY it was released we quickly uploaded v1.0.1 update, and it still is “Waiting for Review” til this day with apple. As soon as it’s done, these glitches will hopefully be gone. But thanks for the honest review.